Meet three members of the Class of 2014 with a diversity population of 17 percent, the largest in College history. The students hail from 21 states and have an overall grade point average of 3.13. Growing up in Northern Virginia, Jahna Kimm Knight relied on donated soccer gear from the time she was 4 years old. As a junior in high school, she realized she had seven pairs of outgrown spikes sitting around. That prompted Jahna to create “All Geared Up,” an organization that collected used athletic equipment for students both at home and as far away as Iraq and Costa Rica. “I got this idea because when I was young, I wasn’t able to afford sports gear,” said Jahna, who was raised by a single mom in Purcellville. She still has a garage filled with used gear, but she will have no trouble finding a new home for it. Jahna will fit right in as a freshman at LC, where there is already an annual “Gifts for Gulu” event to collect used athletic equipment for northern Uganda. During her senior year in high school, Jahna attended Highland School in Warrenton where she not only co-founded “All Geared Up,” but was active in soccer, Key Club, theatre, dance, and Model U.N. In June 2008, she traveled to Peru for 14 days with Purcellville Baptist Church to work on a school building project. The book, Colleges That Change Lives, pointed Jahna to LC, where she hopes to major in economics, psychology, or both. She has already signed up for LC’s newest minor in leadership. 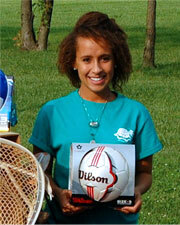 Jahna was hooked on the College because of the genuinely friendly atmosphere. “The first time I visited, I knew I wanted to come here,” she said. Nguyen Tran tells people to call him “when.” That’s about as close as Americans can get to pronouncing his name correctly. A native of Hanoi, Vietnam, Nguyen traveled the farthest of any of the members of the Class of 2014 to begin fall classes. But he decided to attend LC when he lived only an hour away. Nguyen plans to major in business in hopes of returning to Vietnam to start a business with his mother, who is chief accountant for a construction company. His father, an architect, already has his own company. 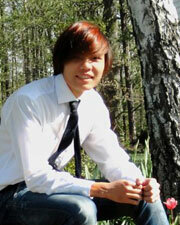 Making the adjustment to American culture wasn’t too hard after Nguyen got past a bout of homesickness. He “Skypes” his family once a week and even watched his older brother’s wedding courtesy of that computer phone call. Nguyen says soccer and photography are his two favorite things (when he’s not studying), but he doubts he’ll have much free time his first year in college as he adjusts to academia. When he first moved to Virginia, Nguyen was most surprised by the number of trees and the countryside because his picture of America was based on movies set in large cities. The food also took a little getting used to but now he likes it. “The food at University of Lynchburg is really good,” he said. When Dylan Gilbert and his mother visited LC last fall from South Glastonbury, Connecticut, they got a personal campus tour from lacrosse coach Steve Koudelka. 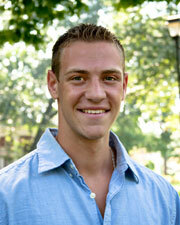 The combination of the “gorgeous campus” and personal attention convinced Dylan to attend LC. “Coach Koudelka is a really amazing person,” Dylan said. “He treated us like family.” A top-notch offensive attack, Dylan was named a “Connecticut Super Junior,” an all-star team composed of high school juniors. His team won. Dylan had been looking at Division I schools, but decided he didn’t want his college years to be all about sports. “School definitely comes first,” he said. Dylan thinks he might want to major in business, but he’s also leaning toward a philosophy minor, under the influence of an older brother majoring in philosophy at Elon University. Family is most important to Dylan, who has two older brothers. His father, who has been through a difficult surgery, inspired him to play lacrosse.